Twitter has now also become embroiled in the Facebook data harvesting scandal - as the Sunday Telegraph reveals that the social media giant sold user data to Aleksandr Kogan, the Cambridge University researcher and director of Global Science Research (GSR), who created an app which harvested the data of millions of Facebook users' without their consent before selling it to political data firm Cambridge Analytica. Kogan says that the data was only used to generate "brand reports" and "survey extender tools" which were not in violation of Twitter's data policies. While most tweets are public information and easy for anyone to access, Twitter charges companies and organizations for access to information in bulk - though Twitter bans companies which use the data for political purposes or to match with personal user information found elsewhere. Data licensing made up 13% of Twitter's 2017 revenue at $333 million. In a March blog post, Citron Research said that Twitter’s 2018 data-licensing business will generate $400 million (analysts polled by FactSet say $387 million) and that it represents the fastest-growing segment of the company’s operations (which it is, according to FactSet). Citron says it is shorting Twitter because it's data business is "vastly more successful and profitable than the company's advertising," along with a large amount of insider selling, low short interest and the unlikely prospect of a near-term acquisition. “Dynamics are in place to short Twitter," Citron said four weeks ago. Of note, Twitter says that it doesn't sell direct messages as part of its data-licensing businesses. A spokesman for Cambridge Analytica said that they used Twitter for political advertising, but had not engaged in "a project with GSR focusing on Twitter data and Cambridge Analytica has never received Twitter data from GSR," adding "Cambridge Analytica is a data-driven marketing agency and does not ‘manipulate political views’." Kogan, meanwhile, told the UK's Department for Digital, Culture, Media & Sport last week that his company, GSR, was founded in 2014 to specifically cater to Cambridge Analytica parent company, SCL Group. 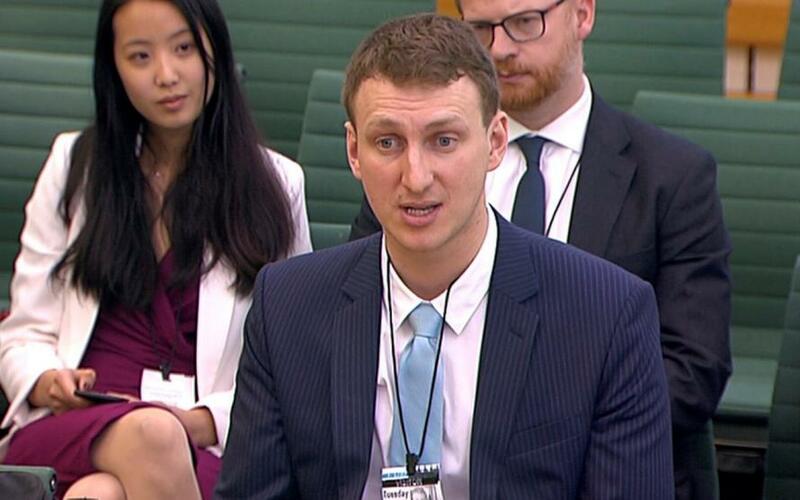 Last week, the Moldovan-born researcher from Cambridge University said he's being used as a scapegoat in the data harvesting scandal, and that there are "tens of thousands" of other apps do the same thing, Kogan said. "It's certain"
"In reality, I think, the truth is we’ve got tens of thousands of over apps that did the same thing, probably on a much bigger scale than me," Kogan told CNBC's Power Lunch. "And they’re all out there and Facebook has no accounting for it." "The amazing thing is if you go and look at Facebook apps literally right now, many, if not most will have language in the terms of service that say they can transfer the data to third parties. I’m not talking about small companies, I am talking about some of the biggest companies in the world. And you can go and do this yourself right now. And Facebook is still not policing it."